Interested in exhibition & advertising opportunities? What is the Local Digital Declaration? The Future of School Funding - What's changing? All's Fair in the Work Programme? How have London boroughs coped? The Work and Health Disability Green Paper was published on 31 October 2016 and confirms the government’s commitment to halving the disability employment gap – a significant challenge. Read the green paper on the GOV.UK website. The green paper explores the actions that the government may wish to take to address the disability employment gap and asks for evidence. Primarily focused on ‘blue sky thinking’, there are also some policy announcements, or statements of changes in political direction. The gap between the disability employment and the employment rate for the rest of the population has hovered at around 30 per cent for over a decade. Halving the gap would require around a million more disabled people to enter employment. Currently, less than half of disabled people are in work (48 per cent), compared to 80 per cent of the non-disabled population. Unemployment can have serious implications for health, and is linked with higher rates of mortality and a lower quality of life. Almost one in three working age people in the UK have a long term health condition which puts their participation at work at risk. The paper argues that suitable work can have important benefits for mental and physical health and is a part of maintaining good health and wellbeing. The government believes it is the best route to raising the living standards of disabled people and people with long term health conditions. An indicative timetable for the implementation of these recommendations from the green paper can be found in the drop-down menu below. The deadline for responses is 17 February 2017. The paper has been produced jointly between the Department for Work and Pensions and the Department for Health. This has been done through the new Work and Health Unit, established in 2015 by the then Prime Minister David Cameron. The unit aims to improve the health and employment outcomes for working age people who have, or may acquire, a disability or health condition. 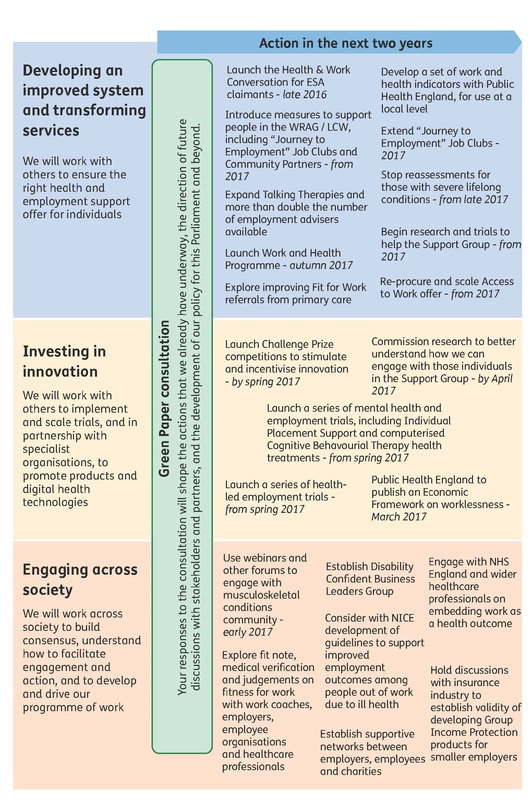 What innovative and evidence-based support are you already delivering to improve health and employment outcomes for people in your community which you think could be replicated at scale? What evidence sources did you draw on when making your investment decision? What evidence gaps have you identified in your local area in relation to supporting disabled people or people with long-term health conditions? Are there particular gaps that a Challenge Fund approach could most successfully respond to? How should we develop, structure and communicate the evidence base to influence commissioning decisions? How do we ensure that Jobcentres can support the provision of the right personal support at the right time for individuals? What specialist tools or support should we provide to work coaches to help them work with disabled people and people with health conditions? What support should we offer to help those ‘in work’ stay in work and progress? What does the evidence tell us about the right type of employment support for people with mental health conditions? If you are an employer who has considered providing a supported internship placement but have not done so, please let us know what the barriers were. If you are interested in offering a supported internship, please provide your contact details so we can help to match you to a local school or college. Should we offer targeted health and employment support to individuals in the Support Group, and Universal Credit equivalent, where appropriate? What type of support might be most effective and who should provide this? How might the voluntary sector and local partners be able to help this group? How can we best maintain contact with people in the Support Group to ensure no-one is written off? Should the assessment for the financial support an individual receives from the system be separate from the discussion a claimant has about employment or health support? What other alternatives could we explore to improve the system for assessing financial support? How might we share evidence between assessments, including between Employment and Support Allowance/Universal Credit and Personal Independence Payments to help the Department for Work and Pensions benefit decision makers and reduce burdens on claimants? What benefits and challenges would this bring? Building on our plans to exempt people with the most severe health conditions and disabilities from reassessment, how can we further improve the process for assessing financial support for this group? Is there scope to improve the way the Department for Work and Pensions uses the evidence from Service Medical Boards and other institutions, who may have assessed service personnel, which would enable awards of benefit to be made without the need for the claimant to send in the same information or attend a face-to-face assessment? What are the key barriers preventing employers of all sizes and sectors recruiting and retaining the talent of disabled people and people with health conditions? What expectation should there be on employers to recruit or retain disabled people and people with health conditions? any other measures you think would increase the recruitment and retention of disabled people and people with health conditions. Should there be a different approach for different sized organisations and different sectors? How can we best strengthen the business case for employer action? How can existing government support be reformed to better support the recruitment and retention of disabled people and people with health conditions? What good practice is already in place to support inclusive recruitment, promote health and wellbeing, prevent ill health and support people to return to work after periods of sickness absence? Should Statutory Sick Pay be reformed to encourage a phased return to work? If so, how? What role should the insurance sector play in supporting the recruitment and retention of disabled people and people with health conditions? What are the barriers and opportunities for employers of different sizes adopting insurance products for their staff? How can we bring about better work-focussed conversations between an individual, healthcare professional, employer and Jobcentre Plus work coach, which focus on what work an individual can do, particularly during the early stages of an illness/developing condition? How can we ensure that all healthcare professionals recognise the value of work and consider work during consultations with working age patients? How can we encourage doctors in hospitals to consider fitness for work and, where appropriate, issue a fit note? Are doctors best placed to provide work and health information, make a judgement on fitness for work and provide sickness certification? If not, which other healthcare professionals do you think should play a role in this process to ensure that individuals who are sick understand the positive role that work can play in their recovery and that the right level of information is provided? Regarding the fit note certificate, what information should be captured to best help the individual, work coaches and employers better support a return to work or job retention? Is the current fit note the right vehicle to capture this information, or should we consider other ways to capture fitness for work and health information? Does the fit note meet the needs of employers, patients and healthcare professionals? How should access to services, assessment, treatment and employment support change for people with mental health or musculoskeletal conditions so that their health and employment needs are met in the best possible way? How can we help individuals to easily find information about the mental health and musculoskeletal services they can access? How can occupational health and related provision be organised so that it is accessible and tailored for all? Is this best delivered at work, through private provision, through the health system, or a combination? What has been your experience of the Fit for Work service, and how should this inform integrated provision for the future? What kind of service design would deliver a position in which everyone who needs occupational health assessment and advice is referred as matter of course? How can we best encourage innovation through local networks, including promoting models of joint working such as co-location, to improve health and work outcomes? How can we encourage the recording of occupational status in all clinical settings and good use of these data? What should we include in a basket of health and work indicators covering both labour market and health outcomes at local level? How can government and local partners best encourage improved sharing of health and employment data? What is the best way to bring together and share existing evidence in one place for commissioners and delivery partners? 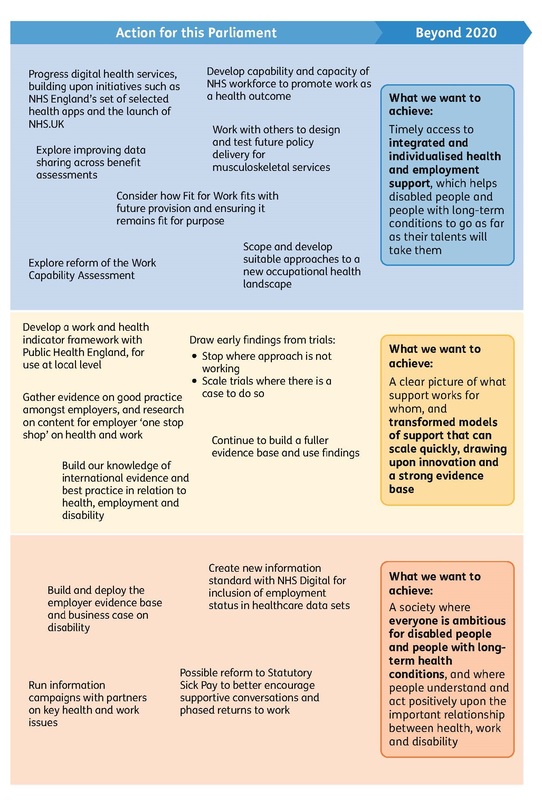 What is the best way to encourage clinicians, allied health professionals and commissioners of health and other services to promote work as a health outcome? How can we bring about a shift in society’s wider attitudes to make progress and achieve long-lasting change? What is the role of government in bringing about positive change to our attitudes to disabled people and people with health conditions? Could any of the proposals within the green paper potentially have an adverse effect on people with a protected characteristic? If so, which proposal, and which protected group/s are affected? And how might the group/s be affected?